Includes a certificate of authenticity and registration which records your name as the original purchaser. 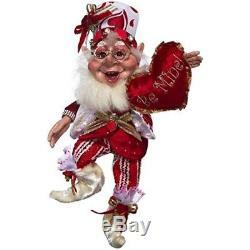 The item "Mark Roberts Elves, Be Mine Elf Medium 18 inches 51-71802" is in sale since Sunday, April 15, 2018. This item is in the category "Collectibles\Holiday & Seasonal\Christmas\ Current (1991-Now)\Figures\Other Curr.ty" and is located in Parrish, Florida. This item can be shipped worldwide.